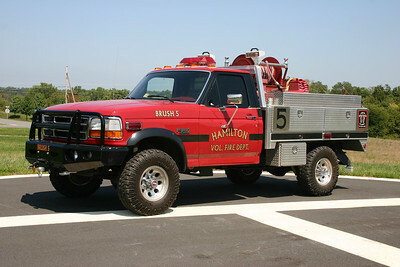 Hamilton VFD, Loudoun County Station 5. 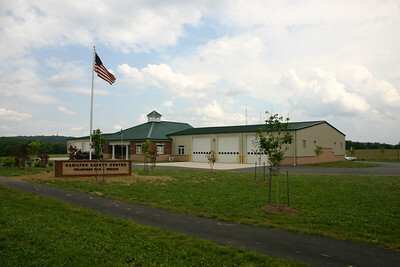 The Hamilton Safety Center houses both Station 5 and Rescue Station 17. The Hamilton Volunteer Rescue Squad (Station 17) shares quarters with Fire Station 5, the Hamilton Volunteer Fire Department. One of three 2017 Pierce Velocity's built for Loudoun County. 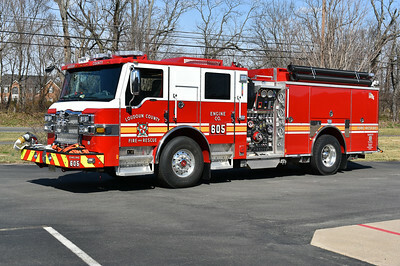 Engine 605 received one of the new one's and it is equipped with a 1500/750/50 and has Pierce job number 30930-02. 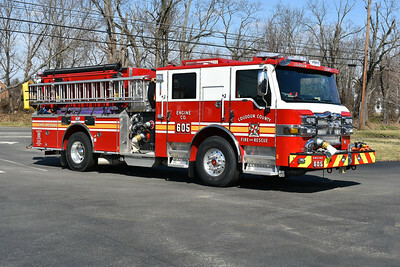 Engine 604 and Engine 623 received the other two. 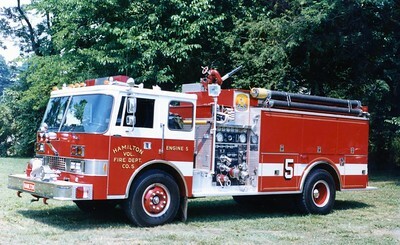 Engine 605B at Hamilton is a 2010 Pierce Velocity 1500/1000/40/40. The Pierce was photographed to the rear of the station at the entrance to the helipad. 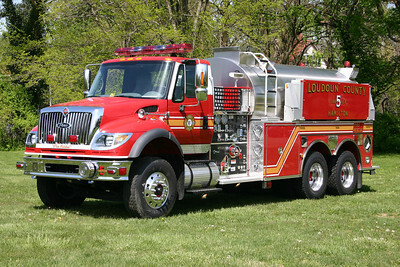 Loudoun County provided Tanker 605, a 2009 International 7600/Pierce 1500/3000. 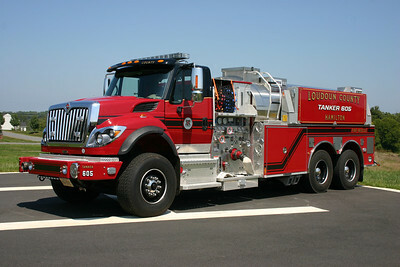 This replaced Hamilton's 2005 International/Pierce tanker which was re-assigned to Tanker 612 in Lovettsville, and later became a county reserve. This photograph became a bit of a challenge. After the tanker was moved to the helipad for photographs, I realized how tall the truck was and the angle would have been a bit distorted. A Hamilton volunteer moved his pick up truck close to the helipad which allowed me to photograph Tanker 605 while standing in the pick up truck bed. 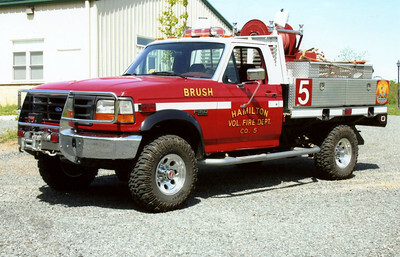 Brush 605 had the black paint added in 2007 when the brush truck was rehabed which included a new flat bed. It is a 1994 Ford F350/LSI equipped with a 250/250. Brush 5 prior to the black and red paint. 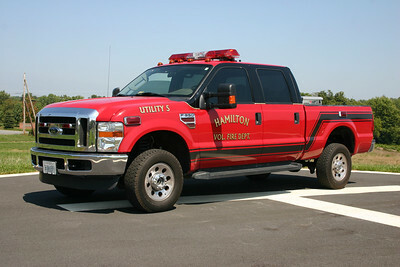 Utility 605 is a 2008 Ford Super Duty outfitted by FastLane. SERV 5 (Special Emergency Response Vehicle) was purchased from the Loudoun County Rescue Squad in Leesburg where it was painted white with an orange stripe. 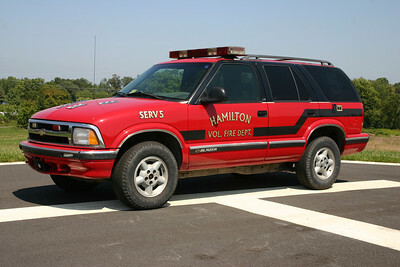 Hamilton purchased the 1997 Chevrolet Blazer in 2004 and had it repainted to red and black. 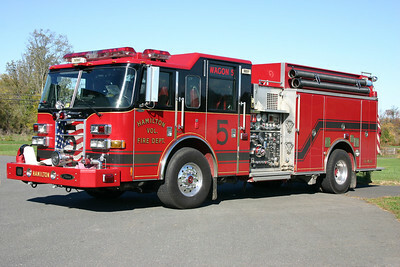 Former Wagon 605 (now Engine 605B) is a 2006 Pierce Dash 1500/1000/40 and was Hamilton's first apparatus painted in their new color of red and black. 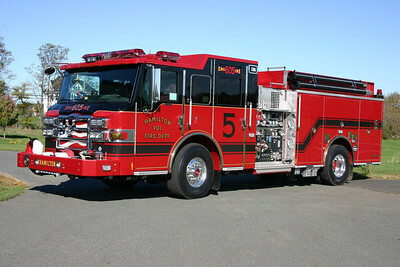 Code 3 collectibles, a detailed builder of fire apparatus models, had Wagon 605 created as part of their exclusive model line up. Sold to Richardsville, Virginia (Culpeper County) in 2017. 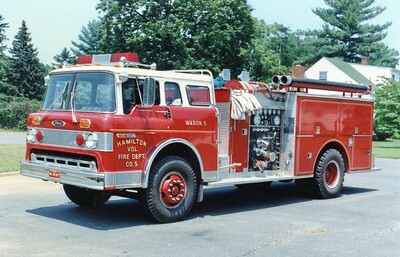 Old Wagon 5 was Hamilton's first four door engine. It is a 1989 Pierce Lance 1250/750 that has been sold. Former Engine 5, a 1984 Pierce Dash, 1000/1500, sn- 2198. 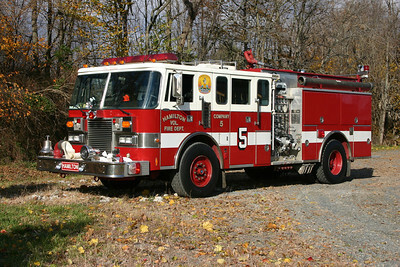 Former Wagon 5, a 1978 Ford C/Pierce, 1000/750. Old Tanker 5 was a county purchased 2005 International 7600/Pierce 1500/3000. It was re-assigned to Lovettsville Station 12 in 2011, and then Tanker 680 in 2013. Photographed at the local park just across the street from old Fire Station 5. Old Light and Air Unit 5 - 1995 Ford F350/Stahl/LSI. Outside of a county air trailer, this was the county's air unit for a number of years. 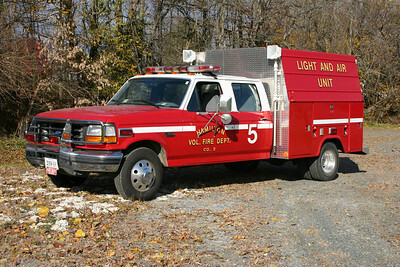 When the county took delivery of Mobile Air Unit 623 in 2005, this truck was kept for several years and was eventually sold in 2007 to Union, Missouri.